Alarm.com enables remote monitoring and control for homes and businesses through full suite of mobile platforms. Alarm.com, the industry leading technology provider of interactive security solutions, today expanded its lineup of mobile apps to include native support for iPad. 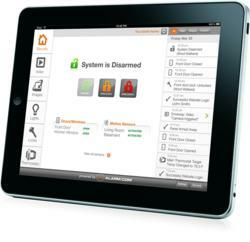 With the latest version of its iOS app, now optimized for iPad, Alarm.com delivers a ubiquitous mobile experience for customers, enabling them to use any of their connected mobile devices to control their Alarm.com powered system. Alarm.com’s native support for iPad is the latest in the company’s expansive mobile app portfolio, which includes native apps for iPhone, Android, Windows Phone 7 and BlackBerry devices, as well as a mobile-friendly website for other web-enabled cell phones. Any Alarm.com subscriber with an interactive service plan can take advantage of the full lineup of Alarm.com mobile interfaces. By bringing interactive services to the devices customers already have in their hands, Alarm.com continues to extend the value and reach of its platform. Through Alarm.com’s mobile apps, users can monitor all system activity in their home, remotely control devices like thermostats, door locks and lights, look into their property through secure video cameras, and receive alerts whenever new activity is reported such as a door opening, power failure or alarm. Alarm.com subscribers increasingly use their mobile devices from inside their properties, whether they are sitting on the couch reading a book on their iPad or locking up the house through their phone from the comfort of their bed at night. For more information on Alarm.com’s mobile apps and whole home solutions, visit http://www.alarm.com. Alarm.com, founded in 2000, is the industry leading technology provider of interactive security solutions. Through its proven technology platform and advanced wireless, mobile and web-based solutions, Alarm.com helps protect and empower hundreds of thousands of residential and commercial customers throughout North America. Alarm.com delivers interactive security, video monitoring, home automation and energy management to users exclusively through a network of thousands of licensed and authorized Dealer Partners. For more information, visit the company’s website at http://www.alarm.com.